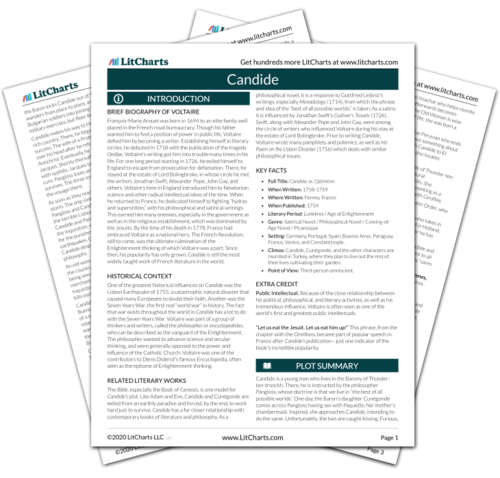 Instant downloads of all 946 LitChart PDFs (including Candide). 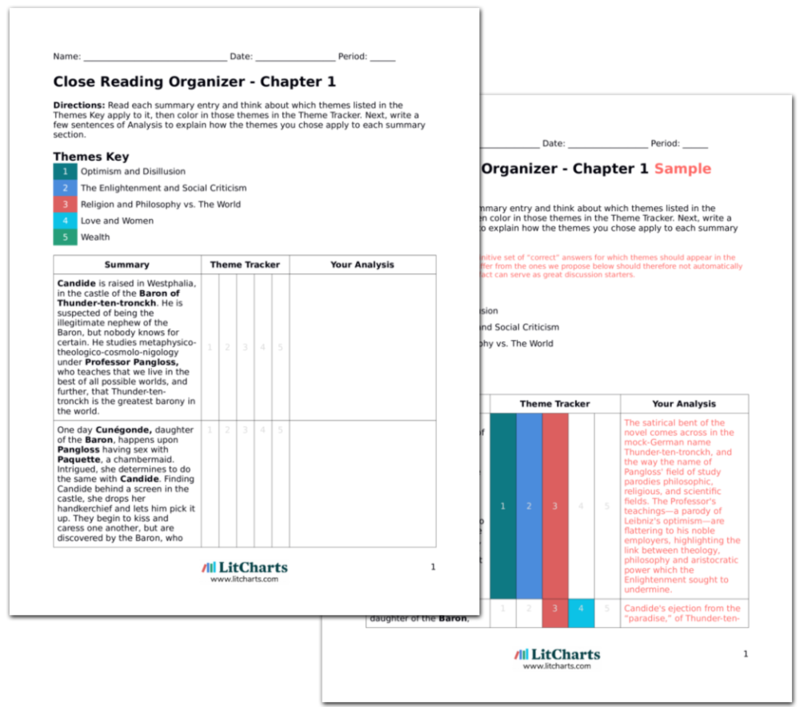 LitCharts assigns a color and icon to each theme in Candide, which you can use to track the themes throughout the work. Finally, Candide, Martin, Pangloss, Cacambo and the Young Baron arrive at the palace where Cunégonde and the old woman work as servants. As Cacambo claimed, Cunégonde has lost all of her beauty. Nevertheless, Candide pays to have both of them freed. When he expresses his intention to marry Candide, the Baron becomes angry yet again, insisting that his sister will not marry a non-noble Candide while he is still living. The humor of this chapter comes from the way it repeats the first one. Candide has gone through years of suffering only to get back into a worse version (now that Cunégonde is no longer beautiful) of the same situation he started in: Candide wishes to be with Cunégonde, and the Baron (son of the old Baron) is violently against it. The Baron's aristocratic stubbornness seems silly—even insane—when we remember that Candide has saved both he and Cunégonde several times. Lucas, Julian. "Candide Chapter 29." LitCharts. LitCharts LLC, 16 Sep 2013. Web. 2 Feb 2019. Lucas, Julian. "Candide Chapter 29." LitCharts LLC, September 16, 2013. Retrieved February 2, 2019. https://www.litcharts.com/lit/candide/chapter-29.